We got a call yesterday that the courts in Ethiopia will not open October 5th as originally stated. They are closing for the next 2 weeks for training. We hope they will begin processing cases on the 12th, but do not have confirmation of that at this point. It is so sad to me that we are getting inched back a little here and a little there, but trying to cling to what I know to be true. I am just so ready to have him here!! Avery painted this canvas for me. She used 2 of my favorite colors and painted one of my favorite verses-- James 1:27. She knows my heart well, and I know the Lord has placed a special place in her heart for all the orphans in the world too. She painted an Ethiopian cross on it to make it the perfect gift! I love the time and thoughtfulness that went into making me this gift. So today, I will celebrate all that I have and forget about the wrinkles and gray hairs on my head. I will embrace the precious gifts before me (and one in Ethiopia) and a dear hubby that makes me feel like a queen. Thank you Kari for doing this! A dear sister Nicole sent me a link to another blog this morning. It had this new song by Selah on it, and oh how it resonated with me! It appears that the enemy is waging war all around us here at Team Alexander, but we will not lose heart as the victory is ours in Christ! It can be a difficult thing to reconcile the hard stuff, the unanswered questions, the betrayal of a friend, the "can hot and cold water come from the same faucet" kind of questions--especially when your children are involved. Ultimately though, God does redeem ALL THINGS for good, for HIS glory and that is where I can rest. The Lord doesn't always reveal why His timing and what we think is best are different, but He did just that for us. We couldn't figure out why we didn't pass court, why our little man needed to stay in the care of others for weeks longer, why, why, why??? Had we passed court on the 12th of August, we would have been in Ethiopia 2 weeks ago- and we really needed to be here, here to process, here to ask and try to answer questions. So we are grateful, we confess our faith is often weak, but He is always strong, always right and His timing ALWAYS best. We pray that we pass on the 5th and are able to go to get our sweet boy at the end of October. We are ready for sure. After a difficult week, how can this not put a smile on your face?? Thank you Lord for our constant ray of sunshine in Abe. 1 Peter 5:8, "Be sober, be vigilant; because your adversary the devil, as a roaring lion, walketh about, seeking whom he may devour." Remember that he isn't a roaring lion, he just acts like one! He is a liar, deceiver and desires to rob, kill and destroy. Pray, fight. I just finished reading the new book by Ron Hall, Denver Moore and Lynn Vincent, and I sit here and type with tears in my eyes. I wrote about Same Kind of Different as Me on July 2nd, 2007- only a few months after starting our adoption journey. I told many people that the Lord used that book to change me, to stir in my heart a desire for MORE, I just didn't know what that "more" was at the time. 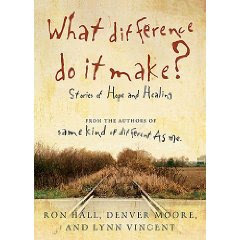 The subtitle of the book is "Stories of Hope and Healing" and contains about a dozen individual stories, many details about Ron and Denver's journey together since the book, along with greater details into their lives before they met. It is so well written and does a beautiful job of showing the difference that one life can make. Deborah ACTED on what she felt called by the Lord to do and set off a chain of events that ultimately "God used our experiences to change people's hearts toward the homeless across the country and around the world." The Lord, in His providence, allowed Abe's story to be told in this new book. I first heard about the new book from my dear friend Mary Lynn, who had heard about it from another friend, Mandy Elmore. I knew immediately if asked, we would love to be involved with this project! We ended up doing several telephone interviews over the course of a few weeks and are so pleased with the words and details used to convey the Lord's work in our lives. We pray that He would be glorified and honored as people read our story, and that others would be called to the command to care for the least of these. I won't go into too many details as I don't want to ruin any of the book, but I love Denver and his many quotes. He justs cuts to the chase and gets to the heart of the matter. He asks Ron one day, "Mr. Ron, all these white folks be invitin us to their Bible studies. How come none of 'em's invitin us to their Bible doins?" OUCH! He then goes on to say, "Since I been visitin a lotta churches, I hear people talkin 'bout how after readin our story, they felt "led" to help the homeless, to come alongside the down and out. But when it comes to helpin people that ain't got much, God didn't leave no room for feelin led........what you gon' do when you get to heaven and you ain't done none 'a that? Stand in front a' God and tell Him, "I didn't feel led?" "
Sleep, well, we still struggle, but some nights he will surprise us. The Lord continues to meet each and every one of our needs and for that we are thankful. You know the old saying "the cobblers children have no shoes"? 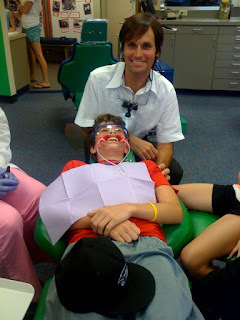 Hill just got his braces on last week and we have often laughed at the above statement being true in our house. Poor guy just went to the office with me while Issy got her braces off (she had some major issues and got them early for a phase 1) and Moody said, "hey, get in a chair. He was a real trooper about it! It is surely a blessing to have a husband that LOVES his work. 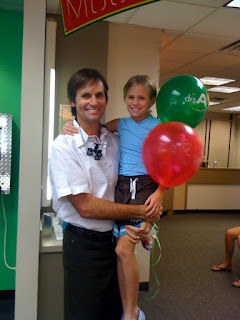 He has the best patients in the world as well. They have wholeheartedly embraced Abe, Ethiopia and our family's journey back. Everyday Moody has someone ask about Abe, lets him know they are praying, keeping up with the blog, etc. 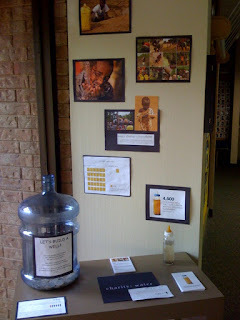 So it is no surprise that they have fully supported the practices effort to build a well in Ethiopia. Moody has partnered with Charity Water to build a well. At each appointment a patient has the opportunity to earn up to 4 wooden nickels. They get them for good hygeine, wearing their t-shirt, being on time, etc. They can save their nickels and trade them in for Target gift cards, webkins, etc. He asked those that were interested to put their nickels in the jug instead. 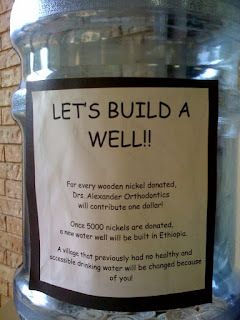 Once they have 5,000 nickels, the well can be built. They started in June and almost have 2,000 nickels. Moody said it is the best sound to hear them fall into the jug as patients leave each day. It has been so encouraging to hear the various stories of patients as they forgo a prize for themselves and give the gift of clean water to those far away from them. We officially started another year of Alexander Academy yesterday. We were all sad that summer was over, but excited about a new year! The Lord has provided for us this school year by giving us a new teacher. :) Hill is in 7th, Wick 6th, Avery 5th, Issy 2nd, sweet baby Abe has therapy 5 days a week and prayerfully we will be adding an active toddler to the mix soon. Lauren is a gift. We met a precious couple this summer at family camp. They were on staff and loved on our kids so well. We found out that Matt was starting at seminary in the fall and she was looking for a teaching position in the area. Moody and I both felt led to ask them to stay with us until they could better determine where they wanted to live, etc. We were thrilled they agreed. We also asked her to pray about being our teacher, but trusted that the Lord may have another opportunity for her in a school. We are blessed that He wanted her here, with us, helping educate our kiddos!! They came in mid-August and don't move into their apartment until mid-October. We have had a BALL with them being here. We play crazy-loud card games, laugh, swim, go on ice cream runs, cook, and just do life together. God in His graciousness, sent them to us at such a difficult time and they have helped in so many ways to lighten the mood.